Beach Signs 2 [E8926] - $7.00 : Yarn Tree, Your wholesale source for cross stitch supplies. Cross stitch chart from Imaginating. Designed by Ursula Michael. 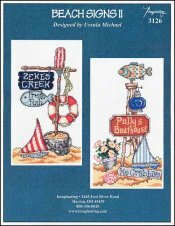 Two beach sign designs, Polly's Boathouse and Zeke's Creek. Both designs feature sail boats and other nautical motifs. Stitch counts Polly's Boathouse 79 x 138 and Zeke's Creek 79 x 138. Stitched on 14ct Aida white.